In the post I made on the 17th, I mentioned that we viewed a video that was projected on to the old Grand Hotel building. We went back and took some video of it. This projection was custom tailored to the building, and was an incredible melding between art and architecture. The building was about 5 stories tall and filled most of your field of view. They also projected images on to the surrounding trees and buildings of the Place Charles de Gaulle, so it was truly an immersive experience. All of the video is pretty cool, but the last few minutes is the best in my opinion. If you can't see the embedded video, you can see the full video here. Sunrise! Taken from our terrace. On Saturday we went in to Nice for the day. We took the number 200 bus from Antibes to Nice and got out along the Promenade des Anglais, and walked along the water enjoying the view and the warmth of the sun and looking at the regal old buildings that line the street. It was a beautiful day. The temp was about 60F, however, that didn't stop some of the more robust residents from taking the plunge and doing a little swimming in the cold water. Oddly though, it only seemed to be the older folks that were doing this. 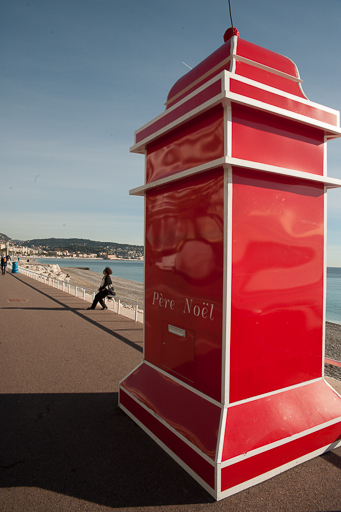 As we were walking we came across several large red mail boxes. These are for little children, or big children for that matter, to post their Christmas letters to Santa. Later, Raquel read that an imp (their word) will collect the letters and take them to Santa's cottage. We had a nice lunch in a cute restaurant near the flower market called La Voglia. Raquel had Merluza with artichokes and rice, and I had a pizza diavolo (spicy sausage) made in a brick oven. Yum! Is it wrong to eat Italian food in France? In my defense, Nice was once more closely allied with Italy and was only fully ceded to the France in 1860 as a reward for their help during Italy's 2nd War of Independence against Austria. There was a busy Christmas Market on the Place Masséna. They had a Ferris Wheel, a skating rink and plenty of shops selling sweets and goodies from the area. You can see some more images here. Sunset from the Promenade des Anglais. Tonight we went out to look at the lights around the town again. 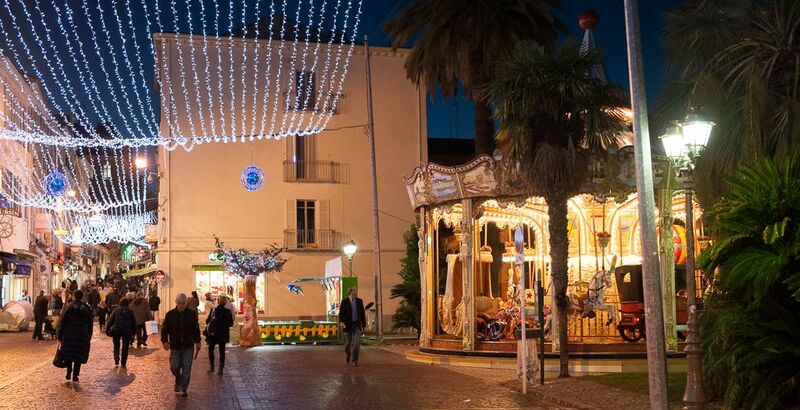 We walked through several of the plazas, and the French are truly enjoying the Christmas season. Many of the streets are decorated with lights. There are several plazas where there are activities for the little kids, and plenty of kiosks selling Christmas items and tasty treats. One kiosk was offering Churros, a typical Spanish treat. Who would have expected to find such things in France. Tonight we went out walking to see the Christmas lights and stopped by La Place Charles de Gaulle, which is the one of the main plazas in the town. They were projecting a movie on the old Grand Hotel building. The projection was custom tailored so that it aligned with the building and made it look like the building facade was constantly changing. I'm not exactly sure what the movie was about, but it was VERY cool! Raquel and I have managed to make it to Antibes, France without any significant hiccups. We flew United Airlines from Houston to Newark, NJ. and then to Brussels, Belgium. We then took a Brussels Airlines flight to Nice, France. Both UA and BA had very good service, although we were in first/business class, so they treated us a little better than the folks in steerage (where we normally sit, thank God for frequent flier miles!). We took the tourist bus from the Nice Airport to Antibes (9 euros as of Dec. 2012). This bus dropped us off at the "Piscine" bus stop near the Antibes train station. From there we hauled our bags the few blocks to our apartment. It was, in all, a pretty uneventful trip. However, jetlag has taken it's toll, and I will be signing out.